I had to spend today cleaning up and putting away all the stuff from the YoYo project. It left a big mess, well, I left a big mess. When I told Rick I was going to write about putting everything away, he looked shocked like I was actually going to photograph the mess. 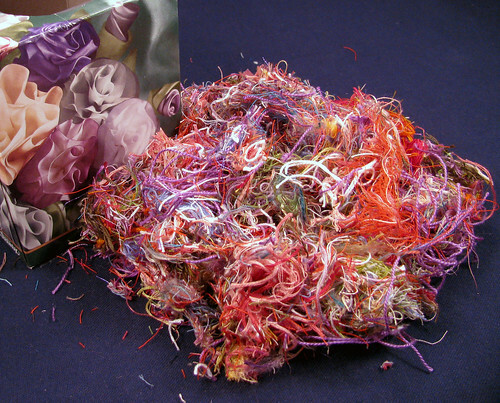 Instead here is a photograph of all the snipped ends I have been saving in an old Kleenex box. I read the threads make good pin cushion stuffing; hard, but still allowing the pins to glide in easily. Soon I should have enough to fill a big pin cushion. As for putting everything away, it is almost done. Thread back on the racks, beads added to the bead drawers, fabric scraps swept up, and books back on the shelves. The only thing now is to get over this lull I always feel at the end of an intense project and get started on something new. This entry was posted on Sunday, December 7th, 2008 at 3:00 am and is filed under Craft. Tagged: Craft, Pin Cushions, Sewing. You can feed this entry. You can leave a response, or trackback from your own site.